Remember getting an Easter basket as a child? It was so exciting to search for the basket and then dig in to the few pieces of candy or chocolates in it! My favorite was always the chocolate cross, but I have to say I loved the chocolate peanut butter eggs just as much. Okay, a little too much. Now I’m a Mom getting Easter baskets ready for my kiddos. When you have four kids, seeing Easter baskets with candy tends to be a scary sight. I get the feeling that a lot of people are overwhelmed at times at how much candy are in Easter baskets these days. At a store recently I overheard a conversation between two ladies about how they miss simple baskets that had just one or two pieces of candy and a little toy. 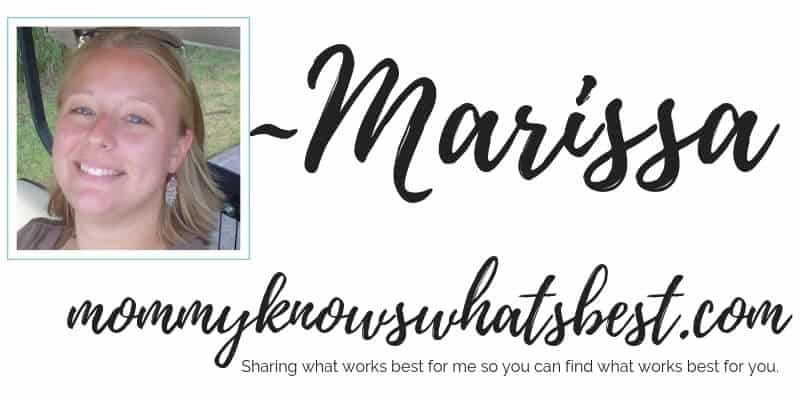 While I don’t go crazy with the amount of items in my kids’ Easter baskets, I do go a little crazy making sure I have the right kind of items in their baskets. Candy Free Easter Baskets for Kids: Practical Ideas! In the past few years, I have stepped away from candy in baskets and have focused on non-candy or sugar-less options. 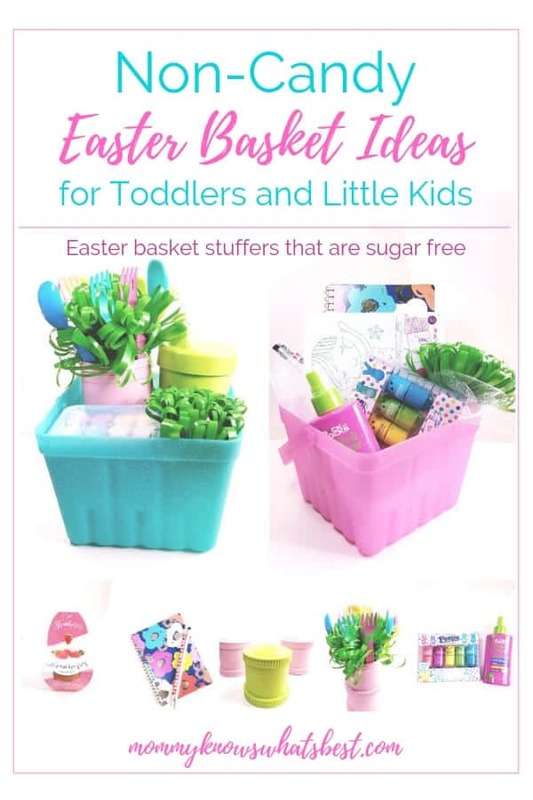 I really love the idea of Easter basket items that serve a purpose rather than just a stuffed toy or egg that gets tossed aside after one day, don’t you? This list of non-candy Easter basket ideas is for kids ages 2-12. Toddlers are so much fun (except during teething, tantrums, and potty training of course…). They’re so curious about the world and love to play and learn. Magnetic Wooden Block Travel Set: Toddlers LOVE to play with blocks. I have a small set of Tegu magnetic wooden blocks that my toddler grabs whenever she gets the chance. These blocks are naturally safe and don’t contain lead, or plastic, or small parts while also being non-toxic. Coloring books and crayons: What little kid doesn’t love to color? Coloring books of any kind would be fun for a toddler. My toddler loves her Crayola Color Wonder books and markers, which are great because they don’t make a mess. Sidewalk chalk: Pretty soon, it’s going to be warm enough to play outside! A small container of colorful sidewalk chalk will fit in any basket. Small watering can, gardening gloves, and shovel: Start an early love for gardening with a small watering can, gardening gloves, and a small shovel. Toddlers love to dig in the dirt (or sandbox if you have one!). Non-Slip Socks: My toddler doesn’t toddle. She runs. She jumps. Our hardwood floors tend to be slippery, so I like to get her non-slip socks so that I can minimize the chance that she’ll fall. Bonus points for cute characters or fun colors! Toddlers LOVE to show their creativity with characters and colors! Snack Containers: Toddlers and snacks go hand-in-hand (or rather hand-and-all-over-floor). Snack containers that are easy for toddlers to hold and are great for transporting snacks are a must. 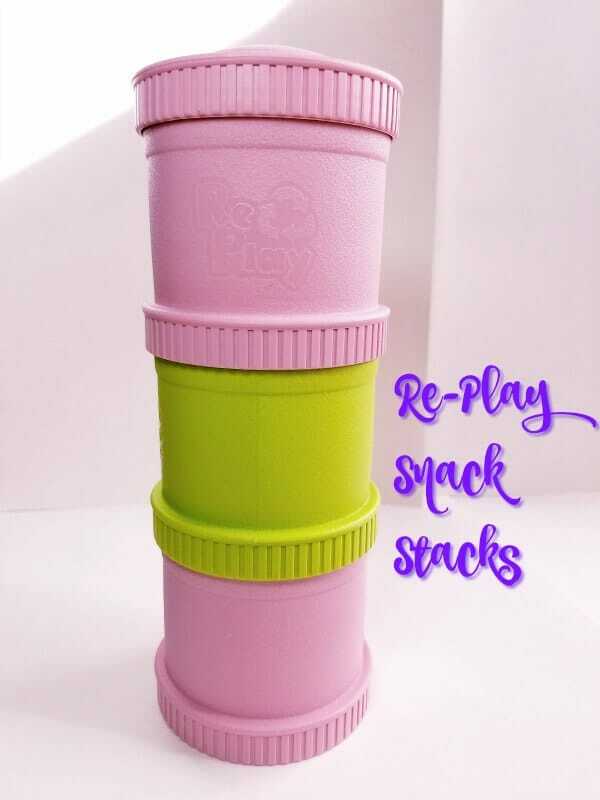 We love our eco-friendly Re-Play Snack Stacks. They stack together (can be mixed and matched) for easy storage. Sippy cups: Another favorite for toddlers that can easily be found in abundance. Make sure to buy cups with adequate spill-proof measures, like our favorite eco-friendly Re-Play No-Spill Sippy Cups. They’re easy to use and easy to clean! 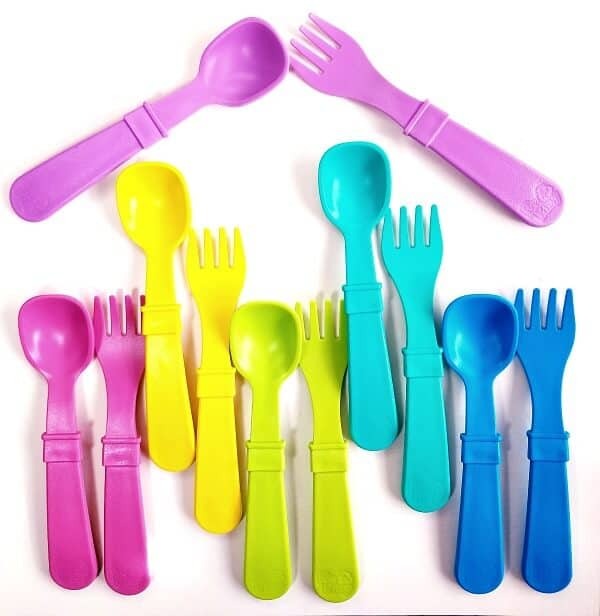 Colorful Tableware: Add more color to dinnertime with colorful tableware. Plates, bowls, and utensils can all be colorful additions to Easter baskets! Most of our favorite colorful tableware comes from Re-Play. I know I’ve mentioned them a few times already, but seriously, we LOVE their stuff! Check out my Re-Play review to see why! Need space in the Easter basket? Try adding a bendable silicone place mat to the basket. 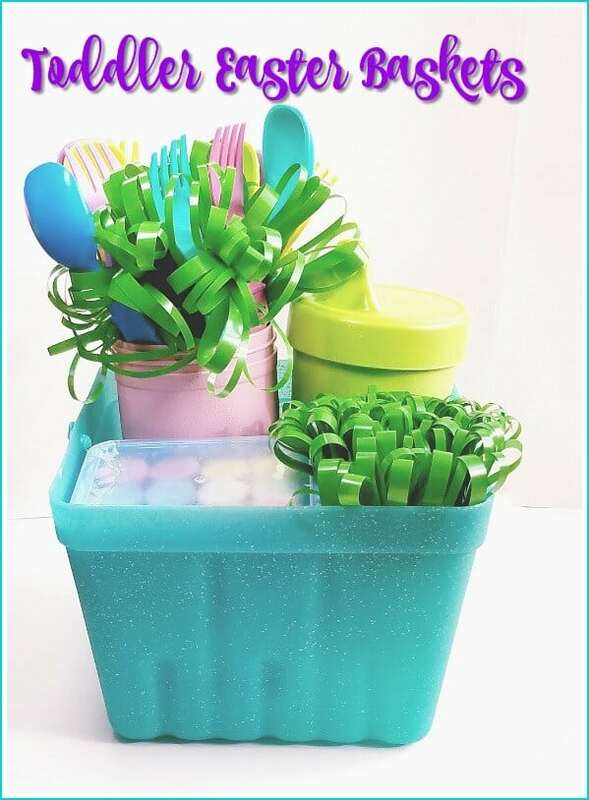 Colorful forks and spoons can also fill in small spaces in baskets! Small board books: Toddlers love books, especially board books! There are a variety of cute books for toddlers out there, including our favorite Sandra Boynton board books. Bubbles: Outside bubbles or bath time bubbles…either type won’t matter to toddlers! Make sure they’re non-toxic and hypo-allergenic. PlayDoh: Toddlers love playing with the squishy stuff. It provides motor skill practice, and let’s just face it, it’s just fun! Baseball cap or sun hat: For those sunny days when you get outside! Hats help to shade little faces from the sun’s rays. Kids’ sunglasses: Keep those little eyes protected. Some toddler sunglasses have a soft strap which may encourage toddlers to keep them on longer. You can also read this list of the best toys for 2 year olds if you need more ideas! What would you add to this list of non candy Easter basket ideas for toddlers? Leave me a comment below! The following candy free Easter basket ideas are for kids ages 4-10 for both boys and girls. Chapter Books: My 7 year old and 9 year old are very much into chapter books that include some sort of adventure. My son loves the How to Train Your Dragon book series while my daughter enjoys the Disney Nevergirls series. Science or STEM kits: My kids LOVE to do science experiments, and I love to encourage their curiosity. Science or STEM kits help parents guide their kids in the right direction! Brick or blocks building sets: What kid doesn’t like to build with bricks or blocks? My kids sit for hours creating and building with their bricks and blocks. Trading Cards: While Pokemon is certainly a favorite trading card game, there are other fun trading cards for kids that would be great in Easter baskets. Temporary tattoos: Kids love temporary tattoos, especially when they have kid-friendly fun designs and last longer than a few minutes! Kite: Go fly a kite! Kites are so much fun for kids and adults alike, plus it gets everyone outside for some fresh air. Reusable water bottles: I’m always encouraging my kids to drink more water. Since I use my own reusable water bottle on a daily basis, they like to have their own bottles too. Beauty and supplies: My daughter loves to do her nails and hair. 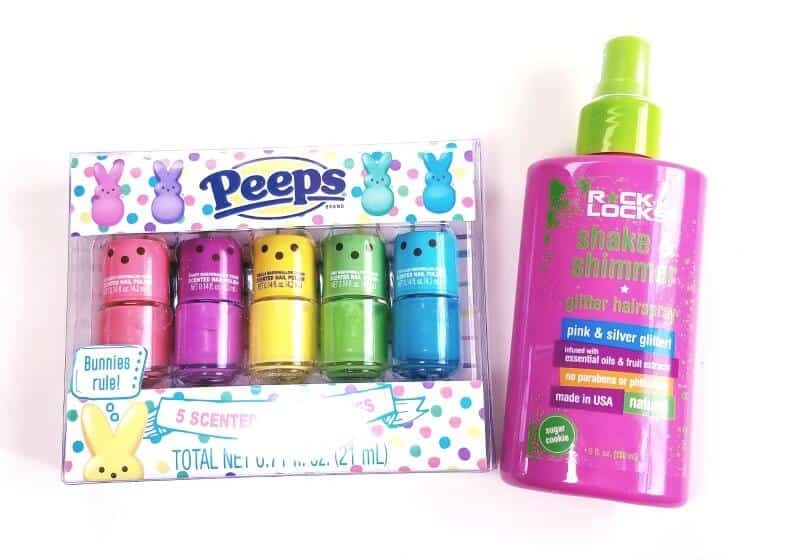 I found these awesome Peeps nail polish set and Rock the Locks Shake & Shimmer hairspray for her Easter basket. Prefer non-toxic and chemical free nail polish for kids? Try Piggy Paints! Glow sticks: My kids love glow sticks, especially for warm nights when we’re still playing outside! Art and crafts supplies: Have a little artist? Kids like to do crafts? Encourage their creativity with some art and crafts supplies! Seed starters: Encourage a love of gardening with some seeds or a mini-grow kit. These little kits are easy to maintain and can be kept on a windowsill. Journal: I loved to journal when I was a child. It’s so funny to go back and read them now as an adult! I think that all kids should be encouraged to keep a journal, even if it’s just to write down what they did for the day or how they’re feeling. Video game or video game accessory: Hands up if you have a gamer in the house! Small video game accessories or video games fit quite well in Easter baskets. Graphic t-shirts: T-shirts are easy to roll up to add to a candy free Easter basket. Jump rope: Get up and get moving! Jump ropes are so much fun, plus they encourage kids to get moving! Small travel board game: Small travel board games fit well in Easter baskets, and they’re great to take on the go! What Would You Put in Candy Free Easter Baskets? What would you add to this list of ideas for candy free Easter baskets? Leave a comment below! Time to go share this list with the grandparents so we’re not inundated with too much candy! I always tried to mix it up for my kids and not do just candy. I included their favorite movie. Or the small prepackaged arts/crafts projects are nice too. Sometimes a new stuffed animal or snuggly toy. I like your breakout for the different ages. Very useful. Movies are great for Easter baskets, and who can pass up a snuggly toy.. Great suggestions! Thanks for the idea!! I am a first time Mom and I honestly want to stay away from getting him candies for his Easter basket! Very informative article. These are such cute ideas! My kids love glow sticks, so I may just have to grab some of those! Ooh, I love that magnetic wooden block travel set. I have never seen that before. Thanks for showing me! Yes the kids just get WAY too much candy at Easter so I vote for more non-candy items! I like to put fidget toys, lip balm, hair accessories & socks in my kids baskets. I think these Easter baskets look great. 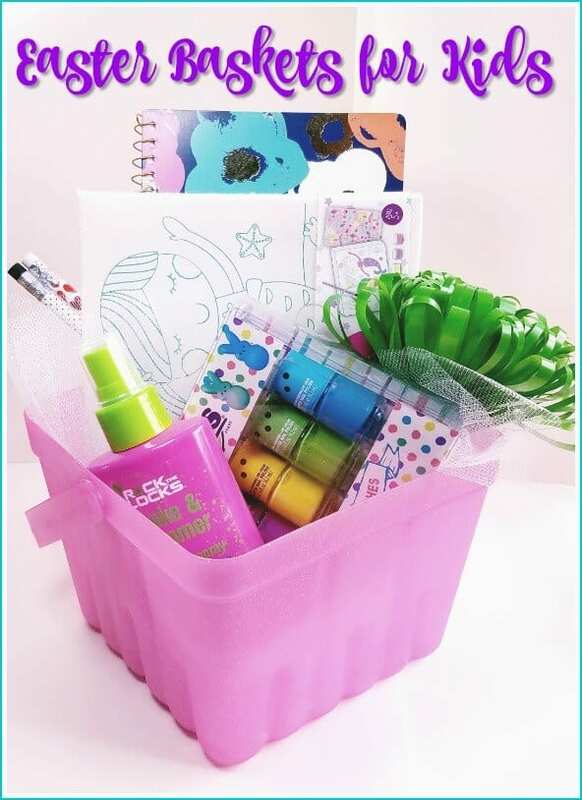 You can include fun art and crafts projects along with colorful toys, books, and accessories. I like the idea of adding bubbles and PlayDoh. I think a mix of candy and non-candy gifts are the way to go. I wanted to say as well I like the idea of the glow sticks as well as journals! These are very good ideas. I like doing non-candy baskets. I think I may do one of these.